Gadget lovers have long held to the secret belief that the right camera, smartphone or large-aperture lens will make them sexier. Now dating site OK Cupid has proof. According to OK Cupid’s survey of 552,000 user pictures, digital SLRs make you look more attractive, Panasonic cameras make you sexier than Nikons, while using a flash will make you look 7 years older, and large-aperture lenses make you hotter. And iPhone users have more sexual partners than BlackBerry or Android owners. By age 30, the average male iPhone user has had about 10 partners while female iPhone users have had 12. 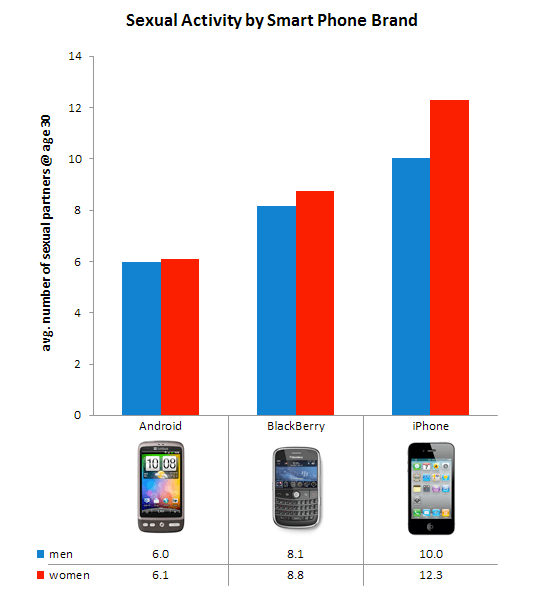 By contrast, BlackBerry users hover around 8 partners and Android users have a mere 6. That should give iPhone and iPad users some comfort for being considered ‘selfish elites,’ as another recent survey found. OK Cupid has been analyzing the behavior of the site’s millions of users for some time, and has discovered many interesting tidbits: People tend to lie on their profiles, people’s political preferences change as they age, and men can increase their chances of getting a date by being open to older women. The site’s massive dataset, huge volume of activity, and interesting slicing and dicing combine to produce some keen observations on human nature. But for gadget heads, there’s no more pertinent observation than (hard) data. The Panasonic Micro 4/3 camera will make you look far more attractive than a Canon DSLR, which in turn is better than a Nikon or Sony DSLR. And forget about cameraphones: Android, Nokia, BlackBerry and Windows phones all make you look less attractive, with Motorola phones at the absolute bottom of the list. Similarly, the type of camera you wield makes a big difference. There’s a dramatic illustration showing how the same woman looks photographed with a cameraphone, a point-and-shoot camera, and an SLR. That makes sense: As we’ve explained before, larger image sensors give you better-quality images. Along the same lines, a larger-aperture photo lets you put the background out of focus, increasing the apparent attractiveness of the person you’re taking a picture of. So if you wanted an excuse to buy a fancier camera with a bigger lens, OK Cupid’s got all the rationale you need. As for switching from Android or BlackBerry to an iPhone? Well, that’s up to you. Unlike with the photos, it’s hard to tell whether iPhone use is the cause, or the effect, of having more notches in one’s bedpost.